I needed a haz-mat suit for that? Horseradish in the food processor. Have mercy. I am still reeling from the fumes. I thought I could handle it — I mean, I’ve grown and roasted all kinds of peppers from thai to habaneros. Gotten them in my eyes and under my fingernail beds, resulting in hours of burn, but I survived. 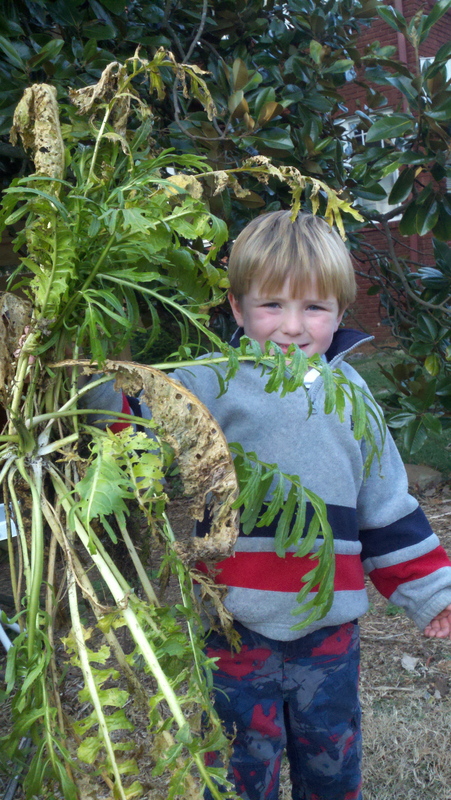 I planted a horseradish root in the corner of one of my raised beds and the plant ended up growing ferny leaves about a foot tall: Note that my 4-year old could safely handle the plant after I dug it up, so I had no indication that it could turn my kitchen into a fumey chemistry lab. Well, I should have heeded the warnings I read online about making the stuff. If my blog had smell-a-vision you’d be running from your screen right now. Seriously, it was like a tear gas bomb exploded in my kitchen. 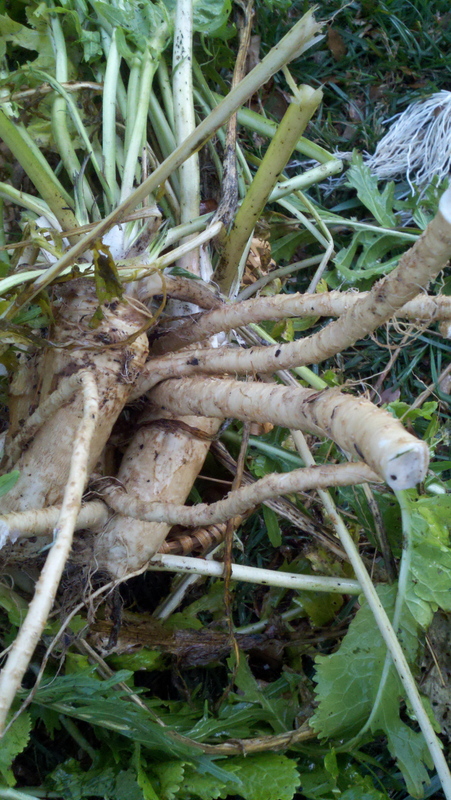 Our garden has had a couple of frosts on it this fall, so it was time to harvest the roots a few days ago. 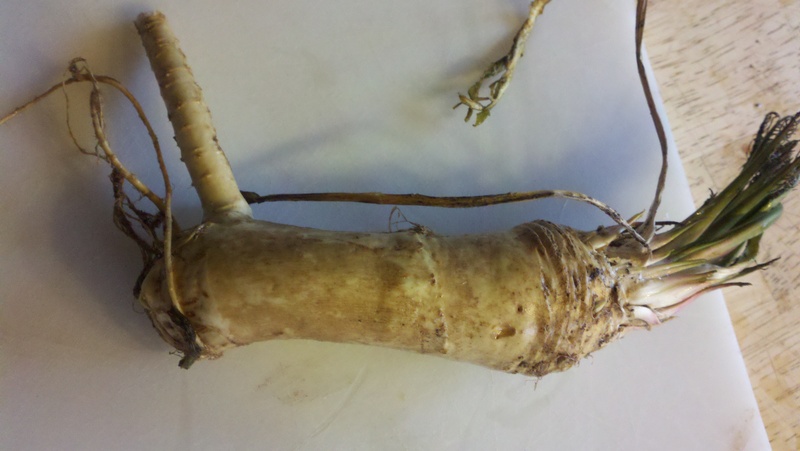 According to a few gardening websites, unless horseradish has had time to go dormant, it won’t have much flavor or kick. I was a little worried that since there were still some green shoots sprouting, it hadn’t gone dormant. I was wrong. All was fine till I started peeling it then chopping it into small cubes to prepare it for the food processor. At that point I started to suspect that the websites insisting that processing horseradish outside or “in a well-ventilated area” might be on to something. But the real chemistry happened about a minute after I got it all ground up. 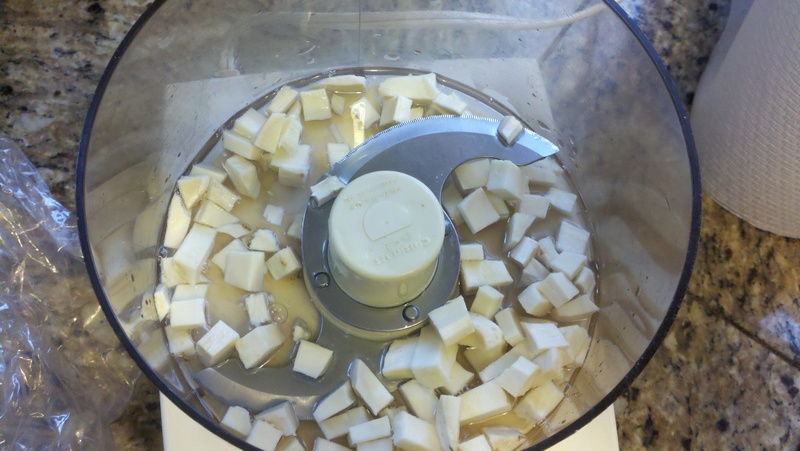 White vinegar stops the chemical process of ground horseradish morphing into battery acid. The longer you wait to put the vinegar in, the stronger the horseradish gets. I think I waited about a minute too long because I could barely get within 2 feet of the food processor. Not kidding. It was that sensation of taking a whopper bite of wasabi, yet it was airborne. 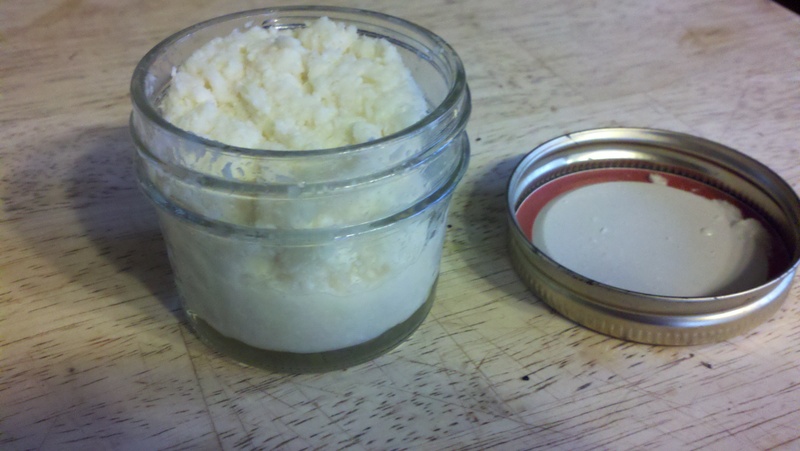 Fortunately the vinegar calmed down the horseradish and I was able to get it into a jar. Now the challenge will be getting somebody to actually try it…. Loved this article. You made me smile. It might be pretty good for a stuffy head cold. i think i know someone who will try it.